Charles Berkeley (1630-1665), the second son of the Royalist Sir Charles Berkeley and his wife Penelope Goldophin, was born in Bruton in the county of Somerset. He began his career as an officer in the troops serving under James the Duke of York, eventually moving over to serve King Charles II. He was knighted at Whitehall in May of 1660, created Keeper of the Privy Purse in October of 1662, created Baron Berkley of Rathdown, and Viscount Fitzharding of Ireland in July of 1663, and Baron Bottetort and Earl of Falmouth in England in March of 1664. He died in action during a battle against the Dutch in Southwold Bay on June 2, 1665 along with Lord Muskerry and Mr. Boyle (son of the Earl of Burlington). All three were all killed by a single shot upon the quarter deck which almost hit the Duke of York. He was married to Court beauty and Lady of Queen Catherine’s bedchamber Mary Bagot (as depicted by Peter Lely) and left one daughter, Lady Mary Berkeley (1665-1693). Sam presents a highly unfavorable view of Berkeley, shamefully introducing his involvement with the plot to disgrace Anne Hyde in order to declare her marriage to the Duke of York void. Sam also reports that “that Sir Charles Barkeley’s greatness is only his being a pimp to the King, and to my Lady Castlemaine.” Berkeley is linked to the group intent on ousting the Lord Chancellor from his position. Sam consistently upholds the view that Berkeley (for no specific reason or stated character trait) was a favorite and highly influential to the King and the Duke. Berkeley’s biographer, Hartmann, tries to “soften” the self-inflicted damage to Berkeley’s reputation in his biography giving the lame premise that all of his acts were done solely out of his devoted loyalty to protect the crown, a view rather unsubstantiated by Berkeley’s contemporaries. The biography about Berkeley is listed below. This book may be available through your local library (with the help of the research department) or is sometimes available through the used book search. This summary incorporates the Denham poem taken from an annotation provided by David Quidnunc. This text was copied from Wikipedia on 16 January 2019 at 6:03AM. Charles Berkeley 1st Earl of Falmouth (11 January 1630 – 3 June 1665) was the son of Charles Berkeley (1599–1668) and his wife Penelope née Godolphin (died 1669), of the Bruton branch of the Berkeley family. He served the exiled Stuart court. His uncle, John Berkeley, 1st Baron Berkeley of Stratton, secured Charles employment with James, Duke of York until the Restoration. He was a cavalry officer and fought in the French and Spanish armies. Charles was subsequently created Baron Berkeley of Rathdowne, co. Wicklow, Ireland, and Viscount Fitzhardinge of Berehaven, Co. Kerry, Ireland, on 1 July 1663. He was created Earl of Falmouth, in the Peerage of England, on 17 March 1664, and Baron Botetourt of Langport, Somerset on the same day. He was promoted Lieutenant-Governor of Portsmouth and was elected MP for New Romney. In 1664 he married Elizabeth Bagot, who as the widowed Countess of Falmouth became a mistress to King Charles II of England. During the Second Anglo-Dutch War he volunteered for service in the Royal fleet. Charles was killed by a cannonball on 3 June 1665 on board the Royal Charles in one of the first exchanges of the Battle of Lowestoft. His boisterous character made him not very well loved by many, but his loyalty to the Royal family favoured his relationship with the King. Clarendon was amazed at the flood of tears the King shed, when he received the news that Berkeley had been killed. "When James had secretly married Anne Hyde (daughter of Clarendon, of Hyde Park fame), Charles' advice was sought. He mistakenly thought that James wished to get out of the marriage. According to the Comte de Grammont, Charles produced four "men of honour". Three described acts of familiarity with Anne, the fourth claiming to "have received from her the last favours". According to Clarendon, Charles had told the Duke "that he was bound in conscience to preserve him from taking a woman so wholly unworthy of him, that he himself had lain with her, and that for his sake he would be content to marry her, though he well knew the familiarity the Duke had had with her". When this approach was rejected by the Duke, and dismissed by the King, Charles (Berkeley) loudly confessed the baselessness of his accusations, declared his confidence in the Duchess' virtue, and sought forgiveness from her." "Charles Berkeley .. who without any visible merit, unless it was the managing of the King's amours, was the most absolute of all the King's favourites". From "The Royal Whore" [biography of Lady Castlemaine] by Allen Andrews (page 41-42). "After the Duke of York married a very pregnant Anne Hyde, he got cold feet and tried to squirm his way out of the marriage and in order to move things along a "gang of courtiers intrigued to convince the gullible James that Anne Hyde was worthless as a wife because they had all had the ultimate favors from her already. The Earl of Arran declared, with defamatory wit, that once at Hounslaerdyke, where James and Anne had become engaged, she had left a game of ninepins on the pretext of feeling faint and he had followed her to a private room, cut her laces, and 'exerted himself to the best of his ability both in succour and consolidation'. Harry Jermyn and Richard Talbot offered additional spurious reminiscences. Tom Killigrew, a licensed wit who had decided that the matter was not yet, clinched, contributed a masculinly diverting but completely imaginary account of how 'he had found the moment of his happiness in a certain closet which was constructed above the water to quite another end than relieving the pangs of love". Three or four 'swans', he added 'had been the witnesses of his good fortune, and he had no doubt that they had witnessed the good fortune of many others in the same closet, since Miss Hyde resorted there often, and seemed indeed inordinately fond of the place'. In conclusion Sir Charles Berkeley, with touching clarity, assured the Duke of York, that he too, had had Anne Hyde, and was not too impressed with her now, but was willing to marry her in order to do the Duke a favor.'" After putting poor Anne through hell and back and having her deliver her son while abandoned by her morally depraved husband, it was "Sir Charles Berkeley who later confessed that his and his cronies' stories of infidelity with Anne Hyde were impure invention." He had the address to secure himself in the affections equally of the king and his brother at the same time. Lord Clarendon, who seems to have conceived, and with reason, a prejudice against him, calls him "a fellow of great wickedness," and says, "he was one in whom few other men (except the king) had ever observed any virtue or quality, which they did not wish their best friends without. He was young, and of an insatiable ambition; and a little more experience might have taught him all things which his weak parts were capable of." -- Clarendon's Life, pp. 34, 267. Bishop Burnet, however, is rather more favourable. "Berkley," says he, "was generous in his expence; and it was thought if he had outlived the lewdness of that time, and come to a more sedate course of life, he would have put the king on great and noble designs." -- History, vol. i. p. 137. He lost his life in the action at Southwold Bay, the 2nd June, 1665, by a shot, which, at the same time, killed Lord Muskerry and Mr. Boyle, as they were standing on the quarter-deck, near the Duke of York, who was covered with their blood. "Lord Falmouth," as King James observes, "died not worth a farthing, though not expensive." -- Macpherson's State Papers, vol. i. "He was, however, lamented by the king with floods of tears, to the amazement of all who had seen how unshaken he stood on other assaults of fortune." -- Clarendon's Life, p. 269. 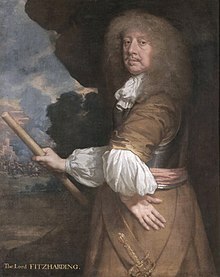 "Pepys, or his informant, was undoubtedly exaggerating Berkeley's influence with the King: but it is, perhaps, understandable that outside observers should have been unable to divine that the young man's rapid rise to favour was due solely to the King's liking for him, and that personal favour did not necessarily bring with it any political influence. In political matters Charles II always knew his own mind and went his own way...The Duke of York was equally friendly with Sir Charles Berkeley, and Pepys never imagined that the Duke was allowing his friend to influence his decisions in political matters. Of this he had been assured by Lord Sandwich. 'Speaking of the Duke of York and Sir Charles Berkeley, my Lord tells me that he do very much admire the good management, and discretion, and nobleness of the Duke, that whatever he may be led by him or Mr. Coventry singly in private, yet he did not observe that in publique matters, but he did give as ready hearing and as good acceptance to any reasons offered by any other man against the opinions of them, as he did to them, and would concur in the prosecution of it.' He had, for instance, refused to endorse Berkeley's recommendation of Colonel Fitzgerald, the deputy governor of Tangier, to be the new Governor, and had instead put forth the name of Lord Teviot. Clearly, the issue of power, whether actual or perceived is causing quite an uncomfortable stir among the king's Court, as sides are being drawn. In this case, the Duke is not perceived as being as easily influenced by the likes of Berkeley as is his brother the king. November 1664, to put England right with Europe, and in particular with France, it was vital to prove that Holland was the aggressor…A new era of diplomacy began with the dispatch of Fitzharding to Paris. His chief friend was Charles Berkeley, made Earl of Falmouth, who, without any visible merit, unless it was the managing the King's amours, was the most absolute of all the King's favourites: and, which was peculiar to himself, he was as much in the Duke of York's favour as in the King's. Berkeley, was generous in his expence: and it was thought, if he had outlived the lewdness of that time, and come to a more sedate course of life, he would have put the King on great and noble designs. This I should have thought more likely, if I had not had it from the Duke, who had so wrong a taste, that there was reason to suspect his judgment, both of men and things. Bennet and Berkeley had the management of the mistress. ---Bishop Burnet's History of His Own Time. G. Burnet, 1753. Created Lord Berkeley of Rathdown, and Viscount Fitzharding (Irish honours) soon afterwards, and, in 1664, Baron Bottetourt, and Earl of Falmouth, in England. He was the second son of Sir Charles Berkeley, of Bruton.